While you want to go out traveling, do you want to take high quality pictures and videos? For the camcorders with advanced configuration, the model size is quite large comparing to the small camera which is light and shoot video and picture with lower quality. Sony Alpha NEX-5 comes out as the smallest HD camera, which is lightweight with AVCHD video. You can recorder 1080i AVCHD or 720p MP4 videos with Sony NEX-5, and 1080i AVCHD is the selling point and advantage of NEX-5 comparing to NEX-3. While the 1080/60i AVCHD video from Sony NEX-5 could not be recognized by QuickTime Player, not even iMovie, we need to convert Sony NEX-5 video to H.264 MOV for playback on Mac. Aunsoft MTS/M2TS Converter for Mac is the top-notch Sony Alpha NEX-5 AVCHD converter for Mac users with Mac OS X like Tiger, Leopard and Snow Leopard. Follow the step-by-step guide below, and you can convert and deinterlace Sony NEX-5 1080/60i M2TS to MOV for QT Player. Step 1. 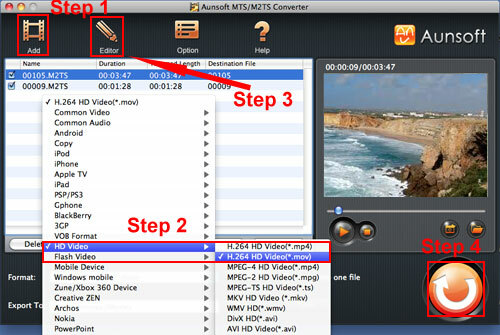 Add Sony NEX-5 AVCHD videos to Aunsoft MTS/M2TS Converter for Mac. Connect Sony NEX-5 to iMac with USB 2.0 cable or use card reader to transfer the .m2ts files to Apple hard drive disk. Run Aunsoft MTS/M2TS Converter for Mac as the best Mac Sony NEX-5 AVCHD converter, and click the "Add" button to load 1080i .m2ts videos. Click the "Format" option, and navigate the mouse cursour to HD Video > H.264 HD Video(*.mov) as output format. The Mac Sony AVCHD converter converter will transcode NEX-5 1080/60i M2TS to H.264 MOV in High-Def 1920x1080. Step 3. Deinterlace Sony NEX-5 M2TS. Click the "Editor" button, go to the Effect tab, and make sure the checkbox for Deinterlacing is ticked. The Mac Sony NEX-5 M2TS converter will deinterlace 1080i M2TS to remove interlacing artifacts. Step 4. Convert Sony NEX-5 M2TS to MOV. Click the convert button under the preview window, and the conversion from Sony NEX-5 1080i M2TS to 1080p MOV for QuickTime Player on iMac will begin soon. 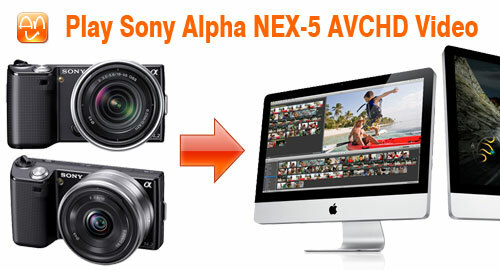 As soon as the conversion is done, you can play Sony Alpha NEX-5 HD videos on Mac without interlaces on iMac/MacBook Pro. If you want to know more information about Sony Camcorder , please visit Aunsoft Sony Camcorder Column.